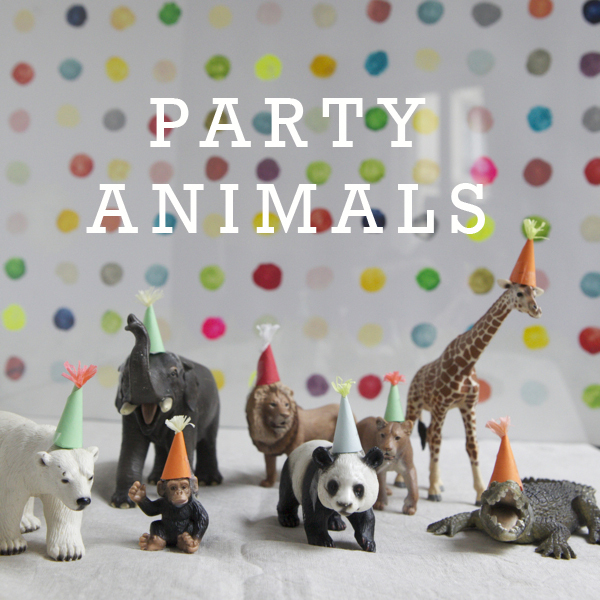 For Roman’s birthday party last week I added some little party hats to some off his toy animals. It was a little easy detail (it took 15 minutes.) But Roman looooved it. We put them on parade and then sang happy birthday to him. It turns out when you put miniature party hats on animals it makes them 1000x cuter. ps: The animals are made by Schleich. They are my favorite, and have a nice little collection going. Also: Here is the mini cakes DIY and here is the polka dot art DIY and here is what we do with the animals at Christmas. oh my cute. yes, at least 100x cuter! Nice idea! These are so cute! The hats are amazing. This is too cute! I remember you guys did something similar at Christmas… you may have just raised the bar with the hats!!! This is SOOO adorable! What a great idea! Thanks for sharing! Fun and interested i love this Nice inspire . Gushing over this! Too cute. I loved your similar post on the animal parade you used to lead your kids to the tree on Christmas morning. I am inspired to do something similar for an upcoming birthday morning at our house. These party hats will tie that together perfectly! This is so cute. I bet kids would just love this. It’s like an upgrade on their toys. Oh the love!!!!! Everything mini is SO fantastic! Your little guy must have thought this was THE COOLEST — which it is. I love love love party hats on the guys!!! 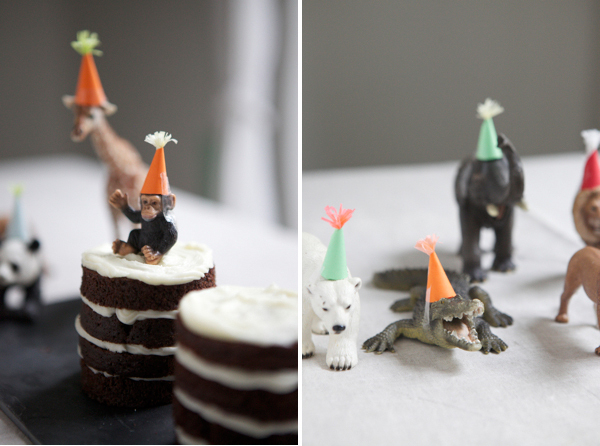 (My husband thought I was nuts when I made party hats for all of my little ones dinosaurs & then for Lego men….) HA! Comfort in numbers? Thank you for sharing! this is so cute! I made a paper hat for my daughter’s 1st b-day last year and I had been thinking of using making a tiny one for a red-headed (like her) playmobile girl and taking a photo for this year’s party invite! See? Who says kids need expensive play things? AWESOME. These are the best! What a fun idea that probably couldn’t be easier to execute. Jordan this is SOOO COOL! This is the happiest thing I’ve ever seen. Awesome. what a nice touch! so simple and celebratory. Um that is pretty darn adorable. My mom would do that for me when I was a kid! Super cute! Love the mini party hats! these are absolutely adorable! love this party idea! So wonderful! What a clever idea! I’ll say those ARE cute! I’ll be they would be cute with red/white Santa hat’s for Xmas too. ha ha ! this cracks me up, i love it ! can’t wait for our next kids’ party to try them out. ha ! I’d really appreciate you stopping by Tulips&Tulle soon! OH, I want to be THREE!!! What fun!! Wow, how adorable. A great idea. papo is better than schleich. and it’s french! This is fabulous! I’m a fan of the Schleich beasts as well. We decapitated a few to make some animal racks (http://roubidou.squarespace.com/roubidou/2011/9/22/animal-racks.html) for our daughter’s nursery and it turns out that the only plastic animals that weren’t hollow inside (so you can screw them in place) are Schleich ones. I’ll have to remember your party hat transformation for when she’s older, so we can dress up the Schleich animals on the racks as a birthday surprise for her to wake up to. SOOOO cute. I totally just went to our local health food place to buy Eden Organics Beans so I could have some BPA-free cans to work with for mini cakes! I only wish some of the larger cans were available BPA-free, but for now I’m super excited to try my hand at your tutorial. Were you inspired by the featured Etsy seller this week? I totally just did this EXACT thing with my son’s plastic horses (except with felt hats). It was fun–the only tough part was getting him to part with the horses for 20 minutes! Hi Kelsey, I wasn’t inspired by anything. I actually did these on February 14th on his birthday. I didn’t know there was a similar Etsy seller. ebb & flow :: fabulous finds & divine designs » Last One in Feb.